Comment: Good Exercise, could really feel the deadlift in the mid portion of my back. The added chin up’s really failed me out by the time I got to the drop set. Comment: Great exercise to isolate the lats when done correctly. I could really feel it! Up weight next time but ensure form is kept. Comment: Great finisher for Back. Feel like I’ve really worked it tonight. 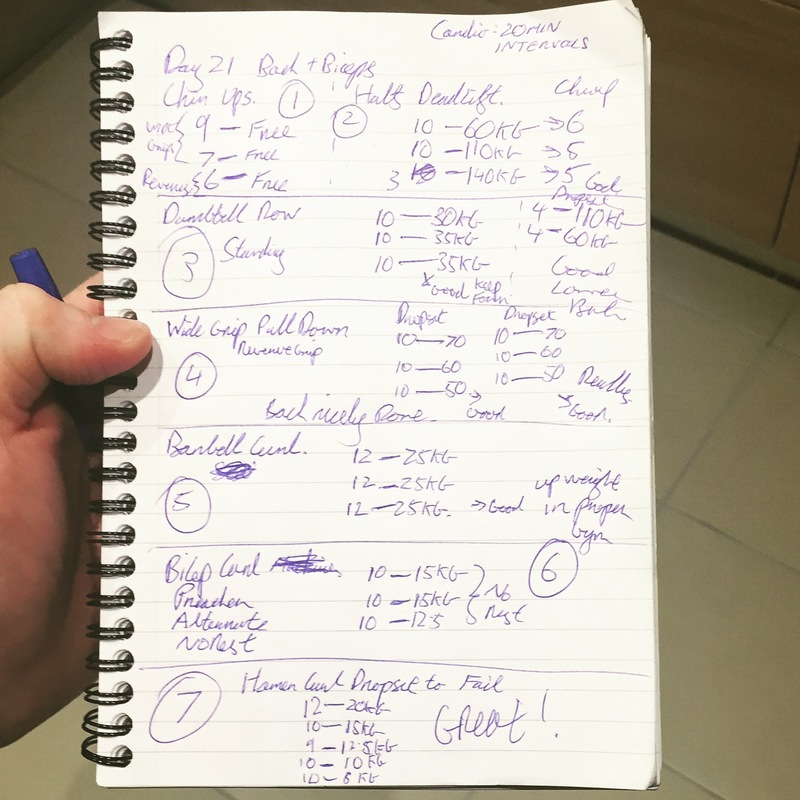 Comment: Up weight next time out and lower reps. More in this! Comment: This worked really well after the barbell curls, My biceps are really pumped! Comment: Great finisher working down the rack. I performed my Cardio at the end of tonight’s workout as I wanted to be fresh for my weights training. We are doing incremental Intervals tonight, every minute is a new challenge. I Love Intervals, I hate Intervals. Every minute we want to move the difficulty up one level, and we want to turn the pedals (RPM) quicker than the previous minute. The idea is that it’s more difficult and you are also pushing faster. do five minutes and then go back to the start. Cardio Mood: Really tough, Quads on fire due to the bike. Happy to have made it through. Great way to finish off week 3, really looking forward to finishing off the week and taking my measurements to see where I’m at. It’s been a good, if not really tiring session!